Maybe it's just the nosy product hoarder in us, but there's an inescapable thrill we experience whenever we have the opportunity to sneak a peek into the beauty routines of our favorite beauty experts. From celebrities to makeup artists to fellow editors, we don't discriminate. However, certain people hold unique intrigue due to the nature of their role within the beauty world. 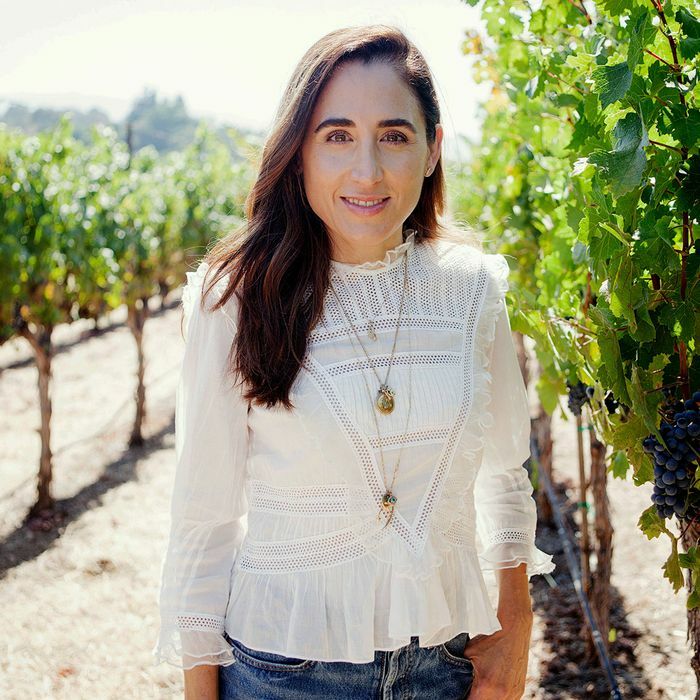 Take April Gargiulo, founder of cult skincare brand Vintner's Daughter. Up until last month, when the Active Treatment Essence ($225) became available, the brand had one product to its name—its Active Botanical Serum ($185)—yet it still somehow managed to amass a cult following. You can read all about the brand and each of the two lust-worthy products here, but essentially, Vintner's Daughter is the skincare equivalent to a mystical fountain of youth, boasting a dedicated genesis of uncompromising formulas that are multi-correctional, performance-driven, 100% active, made from the finest ingredients in the world, and totally safe. With that commitment to high-standard quality in mind, we haven't been able to calm our curiosity as to what the rest of Gargiulo's beauty routine looks like. Sure, we know her basic skincare routine is comprised of a cleanser followed by her brand's the Active Treatment Essence and Active Botanical Serum, but what about her hair? What about her makeup? What about her signature scent? Considering her self-professed love for "old-world luxury," we had a hunch Gargiulo's beauty routine would be covetable and gorgeous, while still following the simple aesthetic Vintner's Daughter is known for. And after asking Gargiulo to reveal her favorite go-to products, our hypothesis has proven correct. "For someone in the beauty world, I'm very uncomplicated in my approach to a daily beauty ritual," she reveals. "I don't have time for a 10-step routine, so although it may be simple, I don't compromise results in any way. I expect a lot from everything I use. That same philosophy is at the heart of Vintner's Daughter. We only create products that add incredible value to our customers' lives through uncompromising quality, unparalleled performance, and complete safety." From a unique Japanese perfume balm to nightly rituals involving microcurrents and light therapy, we got the full scoop from Gargiulo herself in her own words. Curious? Keep scrolling for her complete beauty protocol. "I love this formula from International Orange because my hair is always left feeling incredibly full, and luminous." "I'm actually not a scent person, but this one from In Fiore is sublime." "I really like the black pepper in this oil which helps stimulate circulation. It's also fairly light which I also appreciate." "I'm very simple when it comes to makeup, but Rye Beauty (coming soon!) makes a brow gel that I always use and love. It sets everything in place, but isn’t flaky or shiny. The founder is called the 'Brow Whisperer.'" "I use this device every night without fail. I love microcurrent so much for lifting." "This is another night I use nightly, but instead of lifting and toning like the above, this one targets inflammation. To be honest, I'm not sure it is doing anything yet, but I’ll let you know in ten years!" "I love this mascara from certified organic brand Kjaer Weis because it lengthens and defines my lashes in equal measure." "Almost every jacket I own has one of these amazing tubes in its pocket. The organic formula has just the right amount of color and moisture for me." "I really like the consistency and lightness of this blush and highlighter duo from Kosås. Also, it's pretty foolproof, which is important for me." "The weight of this roller just feels good on the skin. I keep mine in the freezer." Next up, I Found Out Why Everyone Is Freaking Out Over Vintner's Daughter New Product.